National Hockey League (NHL) Official site of the National Hockey League features news, scores, statistics, schedules, player information, Stanley Cup playoffs coverage, video highlights, links to NHL Radio, league history, and more. NHL - Yahoo! Sports NHL coverage from Yahoo! Sports, with scores and schedules, team and player stats, and current standings. Read opinion and commentary from hockey experts, see pictures from the latest matches, or customize your scoreboard. ESPN - NHL Hockey National Hockey League news, scores, standings, stats, video clips, and fantasy league information. Hockey - Slam! Hockey news from Canada's CANOE network. Site offers fantasy league news, season previews, photos galleries, player profiles, Stanley Cup coverage, and stats. The Hockey News The online edition of this print magazine offers current headlines and background features, an NHL pool, and special columnists. Statshockey All sorts of NHL stats - historical & current. Hockey Trade Rumors News, rumors, and gossip. Hockey Glossary Database of hockey terms and phrases. Hockey Hall of Fame Toronto, Ontario based shrine to legendary hockey players, broadcasters, management, writers, and referees. Find information about the exhibits tour, programs, and facilty rentals. Fantasy Hockey - Yahoo! Sports Free fantasy hockey game with live and auto drafts and customized leagues. Internet Hockey Database Search for statistics of players from 1926 to present, get checklists of trading cards, and see the logos of hundreds of teams both new and old. Faceoff.com Brings together hockey writers, columnists, and photographers from the newspapers across Canada. Includes news, opinion, features, and photos, focusing on Canadian teams. TSN.ca: National Hockey League Features NHL news, scores, standings, video clips, player injury reports, Stanley Cup playoffs coverage, and fantasy hockey league updates. Legends of Hockey Net Features player spotlights, photo galleries, indiction showcase, and more. Hockey Research Association Preserving and promoting hockey history and statistics through responsible and accurate research. Goalies Archive Provides the goaltending history of every NHL team. Includes statistics, pictures, and biographies of every goalie who ever played. HockeySandwich Biographies, pictures, and statistics on the world's greatest hockey players, with an emphasis on NHL Hall of Famers. NHL All-Star Game Article discusses the history of the NHL All-Star game. HockeyFights.com Features pictures, stats, fight logs, message boards, and movies about the enforcers. HockeyNewsLink Links to news for all levels of hockey. UltraHockey Offers a guide to NHL news outlets and links to local coverage for every NHL team. The Fourth Period Covering NHL transactions and trade rumors. Includes a message board. The National Hockey League (NHL) is a professional ice hockey league composed of 30 teams in North America. It is considered to be the premier professional ice hockey league in the world, and one of the North American major professional sports leagues. The Stanley Cup, the oldest professional sports trophy in North America, is awarded annually to the league champion at the end of each season. The league was formed in 1917 in Montreal, Quebec, Canada from a predecessor organization, the National Hockey Association (NHA), founded in 1909. It started with four teams, and through a series of expansions, contractions and relocations, the league is now composed of 30 teams, 24 of which are based in the United States and six in Canada. After a labour dispute that led to the cancellation of the entire 2004–05 season, the league has staged a successful comeback, including revenue and profit growth. The NHL draws many highly skilled players from all over the world. Currently, the league has players from about 20 different countries. Canadians have historically constituted a large majority of the players in the NHL because both the sport and the league originated in Canada. In the past 25 years, the percentages of American and European players have increased because of the NHL's continued expansion into the United States, its high standard of play compared to other leagues, and the availability of highly skilled European players. After a series of disputes in the Canadian National Hockey Association (NHA) between Eddie Livingstone, who was the owner of the Toronto Blueshirts, and other owners, the owners of the Montreal Canadiens, Montreal Wanderers, Ottawa Senators, and Quebec Bulldogs met at the Windsor Hotel in Montreal to talk about the NHA's future. Their discussions eventually led to the creation of the National Hockey League on November 22, 1917. Three former NHA franchises, the Canadiens, Wanderers and Senators were founding members of the NHL, along with a new Toronto franchise. Because of the dispute, the Toronto team was given temporarily to the Toronto Arena Corp to operate, and is often referred to as the Arenas, though they operated without a nickname. Even though the league struggled to stay in business during its first decade, the NHL's teams were very successful on the ice; only once, in 1925, did a team from any other league win the Stanley Cup, and by 1926 the NHL was the only league competing for the Cup. The NHL then started a process of expansion: the Boston Bruins (the first U.S.-based NHL franchise) and Montreal Maroons entered the league in 1924–25; the New York Americans and the Pittsburgh Pirates entered in the 1925–26 season; and the New York Rangers, Chicago Black Hawks (now spelled Blackhawks), and Detroit Cougars (now known as the Red Wings) entered in the 1926–27 season, raising the number of teams in the NHL to ten. The Great Depression and the onset of World War II, took a toll on the league, and by 1942 the NHL was reduced to six teams. These six teams (the Montreal Canadiens, Toronto Maple Leafs, Detroit Red Wings, Chicago Black Hawks, Boston Bruins, and New York Rangers) are collectively known as the Original Six, and for the next quarter-century were the only teams in the National Hockey League. During this time the Norris family had influence over four of the teams as Detroit and Chicago were operated by members of the family, and Boston and New York had mortgages to the family. The media would nickname the league the "Norris House League." By the mid 1960s, the desire for a network television contract in the U.S., and concerns that the Western Hockey League was planning to declare itself a major league and challenge for the Stanley Cup, spurred the NHL to undertake its first expansion since the 1920s. Six new teams were added to the NHL roster in 1967, and were placed in their own newly-created division. Two teams each were added in California, Pennsylvania, and the Mississippi River valley. The teams were the Los Angeles Kings, Oakland Seals, Pittsburgh Penguins, Philadelphia Flyers, Minnesota North Stars, and St. Louis Blues. Three years later, the NHL added the Vancouver Canucks and Buffalo Sabres. In 1972, the World Hockey Association was formed, and though it never challenged for the Stanley Cup, the WHA's status as a potential rival to the NHL did not go unnoticed. In response, the NHL decided to rush its own expansion plans in 1972 by adding the New York Islanders and Atlanta Flames (which became the Calgary Flames in 1980) to forestall WHA franchises in newly constructed arenas in those markets, followed by the addition of the Kansas City Scouts (which became the Colorado Rockies in 1976 before becoming the New Jersey Devils in 1982) and Washington Capitals two years later. The two leagues fought for the rights of players and fans until the WHA folded in 1979 as part of an agreement whereby four of the remaining six WHA teams would enter the NHL as expansion teams: the Hartford Whalers (the Carolina Hurricanes since 1997), Québec Nordiques (the Colorado Avalanche since 1995), Edmonton Oilers, and Winnipeg Jets (the Phoenix Coyotes since 1996). With the expansion in 1974, the NHL was aligned into 2 conferences. These conferences, Campbell (representing the west) and Wales (representing the east) each had 2 divisions. The Campbell's divisions were the Smythe and Norris; while the Wales' divisions were the Adams and Patrick. This changed in 1993 when the NHL was realigned into geographical conferences (East & West), divided into 3 divisions. The Eastern Conference currently consists of the Atlantic, Southeast, and Northeast while the Western is made up of the Central, Northwest, and Pacific. Reasons for realignment include further expansion into the U.S. and efforts to expand the NHL's breadth of audience. After a period of stability in the 1980s, the NHL further expanded with nine new franchises in ten years. The San Jose Sharks entered in 1991; a season later the Ottawa Senators would return to the NHL along with the addition of the Tampa Bay Lightning. In 1993, the league added two additional teams, the Mighty Ducks of Anaheim and the Florida Panthers. Next came the Nashville Predators in 1998, the Atlanta Thrashers in 1999, and then the Minnesota Wild and the Columbus Blue Jackets in 2000, bringing the total to 30 teams. On October 5, 2005, the first post-lockout NHL season took to the ice with 15 games, and consequently all 30 teams. Of those 15 games, 11 were in front of sell-out crowds. The NHL received record attendance in the 2005–06 season. 20,854,169 fans, an average of 16,955 per game, was a 1.2% increase over the previous mark held in the 2001–02 season. Also, the Montreal Canadiens, Calgary Flames, Colorado Avalanche, Minnesota Wild, and the Vancouver Canucks sold out all of their home games; all six Canadian teams played to 98% capacity or better at every home game. 24 of the 30 clubs finished even or ahead of their 2003–04 mark. The Pittsburgh Penguins had the highest increase at 33%, mainly because of 18-year-old first overall draft pick Sidney Crosby. After losing a season to a labour dispute in 2005, attendance figures for League teams have returned to solid ground; but the League's TV audience has not because of ESPN's decision to drop the sport from its schedule. The NHL League's current agreement with NBC gives the sport a share of revenue from each game's advertising sales, rather than the usual lump sum paid up front for game rights. The NHL is estimated to earn annual revenue of around $2.27 billion. Original NHL logo, used before 2005. A version of the logo features it in the likeness of a hockey puck. National Hockey League games are played on an oblong hockey rink, similar to a rectangle with rounded corners, and surrounded by a wall. It measures 25.91 by 60.92 metres (85 by 200 ft) in the NHL, while international standards call for a rink measuring 29–30 metres by 60–61 metres (95.14–98.43 ft by 196.85–200.13 ft). The center line divides the ice in half, and is used to judge icing violations. There are two blue lines that divide the rink roughly into thirds, which divide the ice into two attacking and one neutral zone. Near the end of both ends of the rink, there is a thin red goal line spanning the width of the ice, which is used to judge goals and icing calls. The National Hockey League originated in 1917 with four teams, and through a sequence of team expansions, reductions, and relocations currently consists of 30 teams, 24 of which are based in the United States and six in Canada. 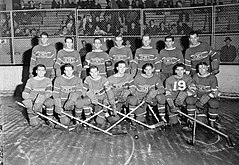 The Montreal Canadiens are the most successful franchise with 24 Stanley Cup championships; in the four major North American professional sports leagues the Montreal Canadiens are only surpassed in the number of championships by the New York Yankees of Major League Baseball, who have two more. The next most successful franchise is the Toronto Maple Leafs with 13 Stanley Cup championships, but they have not won one since 1967. The Detroit Red Wings, with 11 Stanley Cup championships, is the most successful American franchise. The longest streak of winning the Stanley Cup in consecutive years is five, held by the Montreal Canadiens from 1955–56 to 1959–60; the New York Islanders (1980–1983) and the Montreal Canadiens (1976–1979) have four-year championship streaks. The 1977 edition of the Montreal Canadiens, the second of four straight Stanley Cup champions, was named by ESPN as the second greatest sports team of all-time. Of all the major leagues in North America, the NHL is the only league to field teams that play in two countries' capital cities, Ottawa and Washington, DC. 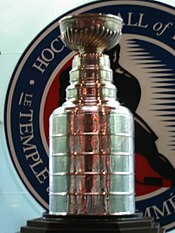 Stanley Cup, on display at the Hockey Hall of Fame, is awarded to the league champion. For more details on this topic, see Season structure of the NHL. The National Hockey League season is divided into a regular season from the first week in October through early to mid April. Clubs play each other in a predefined schedule, and the Stanley Cup playoffs go from April to the beginning of June, which is an elimination tournament where two teams play against each other to win a best-of-seven series in order to advance to the next round. The final remaining team is crowned the Stanley Cup champion. Beginning in 2007, the NHL regular season has begun in Europe while teams not involved complete their exhibition schedule. To begin the 2008–2009 season, the Pittsburgh Penguins will face the Ottawa Senators in Stockholm, Sweden and the New York Rangers take on the Tampa Bay Lightning in Prague, Czech Republic. In each round the higher-ranked team is said to be the team with the home-ice advantage. Four of the seven games are played at this team's home venue — the first and second, and, when necessary, the fifth and seventh games — with the other games played at the lower-ranked team's home venue. The National Hockey League presents a number of trophies each year. The most prestigious team award is the Stanley Cup, which is awarded to the league champion at the end of the Stanley Cup playoffs. The team that has the most points in the regular season is awarded the Presidents' Trophy. There are also numerous trophies that are awarded to players based on their statistics during the regular season; they include, among others, the Art Ross Trophy for the league scoring champion (goals and assists), the Maurice 'Rocket' Richard Trophy for the goal-scoring leader, and the William M. Jennings Trophy for the goalkeeper(s) for the team with the fewest goals against them. For the 2006–07 season these statistics-based trophies were awarded to Sidney Crosby of the Pittsburgh Penguins, Vincent Lecavalier of the Tampa Bay Lightning, and, dually, Niklas Bäckström and Manny Fernandez of the Minnesota Wild respectively. The other player trophies are voted on by the Professional Hockey Writers Association or the team general managers. The most prestigious individual award is the Hart Memorial Trophy which is awarded annually to the Most Valuable Player; the voting is conducted by members of the Professional Hockey Writers Association to judge the player who is the most valuable to his team during the regular season. The Vezina Trophy is awarded annually to the person deemed the best goalkeeper as voted on by the general managers of the teams in the NHL. 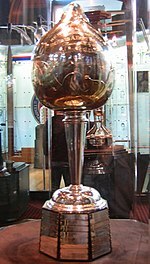 The James Norris Memorial Trophy is awarded annually to the National Hockey League's top defenceman, the Calder Memorial Trophy is awarded annually to the top rookie, and the Lady Byng Memorial Trophy is awarded to the player deemed to combine the highest degree of skill and sportsmanship; all three of these awards are voted on by members of the Professional Hockey Writers Association. One interesting aspect for the trophies in the NHL is that the same trophy is reused every year for each of its awards. The Stanley Cup, much like its CFL counterpart, is unique in this aspect, as opposed to the Vince Lombardi Trophy, Larry O'Brien Trophy, and Commissioner's Trophy, who have new ones made every year for that year's champion. Despite only one trophy being used, the names of the teams winning and the players are engraved every year on the Stanley Cup. The same can also be said for the other trophies reissued every year. Players, coaches, officials, and team builders who have had notable careers are eligible to be voted into the Hockey Hall of Fame. Players cannot enter until three years have passed since their last professional game, the shortest such time period of any major sport. One unique consequence has been Hall of Fame members (specifically, Gordie Howe, Guy Lafleur, and Mario Lemieux) coming out of retirement to play once more. In the past, however, if a player was deemed significant enough, the pending period would be waived; only ten individuals have been honoured in this manner. In 1999, Wayne Gretzky became the last player to have the three-year restriction waived, and after Gretzky's induction, the NHL declared that he would be the last to have the waiting period omitted. Wayne Gretzky in a New York Rangers uniform in 1997. The Reigning Hart Trophy winner (Given to the league's most valuable player) is Alexander Ovechkin. The top five point scoring forwards in the 2007–08 season were Alexander Ovechkin, Evgeni Malkin, Jarome Iginla (all current Hart Trophy nominees), Pavel Datsyuk and Joe Thornton. The top goal scorer was Alexander Ovechkin with 65, followed by Ilya Kovalchuk (52) and Jarome Iginla (50). The top four scoring defencemen were Nicklas Lidstrom, Sergei Gonchar, Mark Streit, and Brian Campbell and the top goaltenders (by wins) were Evgeni Nabokov (46), Martin Brodeur (44), Miikka Kiprusoff (39), Henrik Lundqvist (37), and Cam Ward (37). In addition to Canadian and American players, who have historically composed a large majority of NHL players, the NHL draws players from all over the world. Since the collapse of the Soviet Bloc, restrictions on the movement of hockey players from this region have lessened and there has been a large influx of European players into the NHL such as Alexander Ovechkin. European players were drafted and signed by NHL teams in an effort to bring in more "skilled offensive players". Although recently there has been a decline in European players as more American players enter the league. The addition of European players changed the style of play in the NHL and European style hockey has been integrated in to the NHL game. Conversely Canadian coaches and the Canadian style of play have been embraced by many European countries. Because of the continued success of Canadian teams in world tournaments many other countries are trying to model their development programs after Hockey Canada's. In Winter Olympic years, the league voluntarily suspends its season so that NHL players can play in the Winter Olympics, representing their native countries (though this practice may end after the 2010 Winter Olympics, which will be held in an NHL city, Vancouver). Currently the NHL has players from 18 different countries, with the majority (52.0 percent during the 2007–08 NHL season) coming from Canada. In Canada, National Hockey League games are aired nationally by the Canadian Broadcasting Corporation (CBC) and The Sports Network (TSN). Regional games are broadcast by a number of networks including Rogers Sportsnet (RSN). French language games are broadcast by the Réseau des sports (RDS) and Réseau Info-Sports (RIS), but no longer is on Radio-Canada (the French-language counterpart of the CBC), which created a controversy in French-speaking Canada. The program Hockey Night in Canada, usually aired on Saturday nights on CBC, is a long-standing Canadian tradition since first airing on television in 1952, and even prior to that on radio since the 1920s. During the playoffs, the CBC airs all games that involve Canadian teams and the Stanley Cup finals; TSN airs certain other games during the first three rounds. Versus had about 20 million fewer subscribers than ESPN when the NHL started on Versus, but Comcast switched Versus from a digital tier to basic cable to make NHL games available to more cable subscribers. For Versus the NHL coverage was a good addition as Versus' ratings grew by about 275% when it showed an NHL game. The 2007 Stanley Cup Finals were the lowest rated in the United States in history. As a whole, the television ratings on NBC were down 20% from last year's series, with Game 3's coverage on NBC garnering a mere 1.1 rating (approximately 1,205,600 households), making it the lowest rated prime-time broadcast in the network's history. However, coverage in Canada on CBC pulled in 2,608,000, 2,378,000, and 2,553,000 (for Games 1, 2, and 3 respectively), slightly higher than their numbers for the first three games in 2006. Comparatively, in 1994, when the New York Rangers were involved, game 7 of the Stanley Cup finals posted a rating of 5.2. Although 2007 saw low Stanley Cup Finals ratings, the 2008 series between Detroit and Pittsburgh drew one of the highest Stanley Cup ratings ever with strong 4.4 as the high overnight rating. Outside of North America, NHL games are broadcast across Europe on NASN (North American Sports Network) which takes feeds from Versus, FSN, TSN and CBC (including Hockey Night in Canada), and MSG. Games can also be seen in the UK on Five. The NHL is considered one of the four major professional sports leagues in the North America, along with Major League Baseball, the National Football League, and the National Basketball Association. Hockey has the smallest total fan base of the four leagues, the smallest revenue from television, and the least sponsorship. In contrast, hockey is the most popular of these four major sports in Canada. The NHL fan base is also the most affluent and well educated of the four. NHL season ticket prices have traditionally been higher (given the number of games per season) than the other sports. Chi-Kit Wong, John (2005). Lords of the Rinks. ISBN 0–8020–8520–2. Coleman, Charles (1966–1969). Trail of the Stanley Cup, vols. 1–3. Holzman, Morey; Joseph Nieforth (2002). Deceptions and doublecross : how the NHL conquered hockey. Toronto, ON, Canada: Dundurn Press. ISBN 1–55002–413–2. McFarlane, Brian (1997). Brian McFarlane's History of Hockey. Champaign, IL: Sports Publishing Inc. ISBN 1–57167–145–5. National Hockey League (2005). "2005–06 NHL Official Rules". NHL.com. Retrieved on 2006-06-10. ^ Marsh, James (2006). "National Hockey League". The Canadian Encyclopedia. Retrieved on 2006-06-11. ^ "NHL.com - Stanley Cup Fun Facts". NHL. Retrieved on 2006-07-15. ^ a b IWHC.net (2006–05–16). "NHL still likes Czechs best". IWHC.net. Retrieved on 2006-06-09. ^ "NHL aims to put global warming on ice". NHL.com. Retrieved on 2008-04-26. ^ Boyle, Robert H. (1959-02-02). "Black Hawks On The Wing". Retrieved on 2008-04-25. ^ a b CBC Sports (2004–01–29). "We've been here before". cbc.ca. Retrieved on 2006-06-09. ^ a b c d audohar, Paul D. (December 2005). "The hockey lockout of 2004–05" (PDF). Monthly Labor Review, http://www.bls.gov/opub/mlr/2005/12/art3full.pdf. ^ NHL.com (2005–10–06). "NHL returns with packed arenas, single-date attendance record". NHL.com. Retrieved on 2006-06-09. ^ a b c d Molinaro, John (2006–04–20). "A season to remember". CBC.ca. Retrieved on 2006-06-09. ^ Mackin, Bob (2006–04–18). "Canucks abuse fan trust". Slam Sports. Retrieved on 2006-07-03. ^ Finder, Chuck (2005–8–19). "Penguins ticket sales hit the roof". Pittsburgh Post-Gazette. Retrieved on 2006-12-11. ^ National Hockey League (2006). "Time of match". NHL.com. Retrieved on 2006-12-02. ^ Fitzpatrick, Jamie. "How the NHL Shootout Works". About.com. The New York Times Company. Retrieved on 2008-08-04. ^ "Oh, what a night ... and morning. Stars-Canucks ranks sixth among longest OT games.". Sports Illustrated (2007). Retrieved on 2007-04-26. ^ Clement, Bill. "Playoff overtime format needs change", NBCSports.com. Retrieved on 9 May 2008. ^ National Hockey League (2005). "Dimensions of Rink". NHL.com. Retrieved on 2006-06-08. ^ a b National Hockey League (2005). "Division of ice surface". NHL.com. Retrieved on 2006-06-08. ^ National Hockey League (2005). "Goal crease". NHL.com. Retrieved on 2006-06-08. ^ National Hockey League (2005). "Goalkeeper's Penalties". NHL.com. Retrieved on 2006-06-26. ^ a b c CBC sports (2005–07–22). "Relaunching the Game". CBC.com. Retrieved on 2006-06-10. ^ a b National Hockey League (2005). "Icing the puck". NHL.com. Retrieved on 2006-06-08. ^ National Hockey League (2005). "Major penalties". NHL.com. Retrieved on 2006-06-08. ^ CBC.ca (2006). "Ice Hockey Essentials - International vs. NHL". NHL.com. Retrieved on 2006-06-26. ^ a b National Hockey League (2005). "Minor penalties". NHL.com. Retrieved on 2006-06-08. ^ Laurie, Scott (2005–09–28). "NHL unveils new drug testing policy". CTV. Retrieved on 2007-01-02. ^ Fitzpatrick, Jamie (2006). "Stanley Cup Winners". about.com. Retrieved on 2006-06-26. ^ ESPN (1999–12–31). "The 10 greatest teams". ESPN.com. Retrieved on 2006-06-26. ^ CBC Sports Online (2005–07–27). "NHL ramps up rivalries". CBC.com. Retrieved on 2006-06-06. ^ Sillinger, Shawn (2006–05–14). "NHL standings: A simple solution". betus.com. Retrieved on 2006-06-06. ^ a b "Playoff formats". NHL.com (2005). Retrieved on 2006-06-06. ^ a b c d "NHL announces 2006–07 trophy finalists". NHL.com (2007–05–01). Retrieved on 2007-06-19. ^ Canadian Press (2005–11–7). "Roy on deck for 2006, 'mayhem' in 2007". tsn.ca. Retrieved on 2006-06-08. ^ a b phoenixcoyotes.com (2006–05–31). "Wayne Gretzky signs five-year contract as head coach". phoenixcoyotes.com. Retrieved on 2006-06-09. ^ NHL.com (2008–04–28). "NHL.com -Stats". NHL.com. Retrieved on 2008-04-24. ^ a b Wigge, Larry (2002–02–25). "New world order: as the Olympics have shown, the influx of players from across the Atlantic brought changes to the NHL game". The Sporting News. Retrieved on 2006-06-11. ^ Beacon, Bill (199–06–27). "Canadians left behind as NHL goes for firepower". Canadian Press. Retrieved on 2006-06-11. ^ PODNIEKS, ANDREW (2008–05–10). "NHL landscape changes". IIHF. Retrieved on 2008-05-13. ^ PAKARINEN, RISTO (2008–05–08). "Canada's top export: coaches". IIHF. Retrieved on 2008-05-13. ^ "NHL won’t commit to Olympics beyond ’10". NBC Sports (2006–02–18). Retrieved on 2006-06-11. ^ CBC.ca (2005). "HNIC in 2005–06". CBC.ca. Retrieved on 2006-06-19. ^ CBC.ca (2005). "Hockey Night in Canada: A history of excellence". CBC.ca. Retrieved on 2006-06-19. ^ a b c Weiner, Evan (2006–06–16). "Don't Believe the Gripe: The NHL Is Back". nysun.com. Retrieved on 2006-06-19. ^ Reed, Tom (2006–06–05). "NHL ratings toppling like dominoes". Akron Beacon Journal. Retrieved on 2006-06-15. ^ XM Satellite Radio (2007-06-28). "XM to Become Exclusive Satellite Radio Carrier of NHL". Press release. Retrieved on 28 June 2007.